Today’s launch was the 103rd Ariane 5 mission, bringing the number of geostationary satellites launched by Arianespace to 374. – Saudi Geostationary Satellite 1 will provide advanced communications services for Saudi Arabia’s KACST (King Abdulaziz City for Science and Technology), as well as secure communications for countries belonging to the Gulf Cooperative Council region. – Hellas Sat 4 will provide advanced regional communications services for Arabsat’s subsidiary, Hellas Sat, the Greek-Cypriot satellite operator. 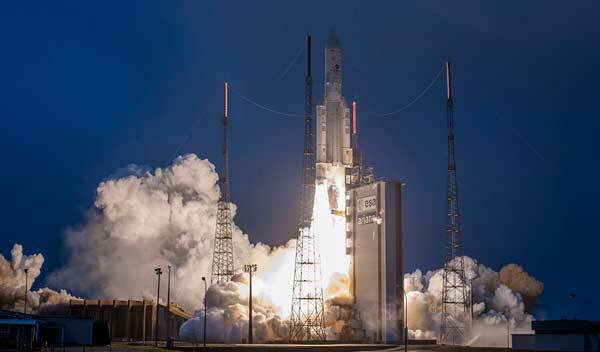 After launching GSAT-11 for ISRO on the final Ariane 5 mission of 2018, Arianespace has now orbited GSAT-31 on its first mission in 2019. With GSAT-31, ISRO continues to develop its space infrastructure to reduce the digital divide in India. The next ISRO geostationary satellite to be launched by Arianespace will be GSAT-30. This first Ariane 5 mission of the year placed two satellites in geostationary transfer orbit. Arianespace confirmed its business momentum and leadership in the geostationary telecommunications satellite market during 2018 by signing launch contracts for eight more satellites, bringing the total number of geostationary telecommunications satellites in its backlog of launch orders to 26. Up to five Ariane 5 dual launches are planned in 2019, to orbit a total of 10 geostationary satellites. Designed by French CNES space agency within the scope of a European Space Agency program with 12 participating countries, Ariane 5 is built by ArianeGroup as industrial prime contractor.